Do you have barely there or sparse brows? Do you always have to pencil your brows in, only to smudge them off accidentally throughout the day? Wouldn’t it be fabulous to wake up every morning with perfect eyebrows? It is important to understand that due to different brow bones and facial muscles it is impossible to achieve absolute perfection‚ but through the measurement and drawing of an outline to shape your new brows‚ we can achieve a natural fuller shaped brow that will leave you feeling thrilled with your new look! My ultimate goal is to make every woman I have the pleasure of working with feel like they are the most beautiful woman in the world by accentuating their unique characteristics. 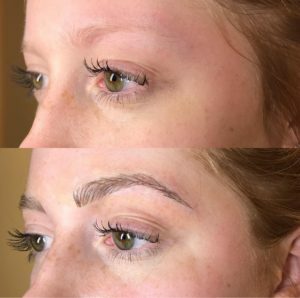 To schedule an appointment or microblading consultation please contact us at (215) 390-2058. We look forward to serving your unique beauty needs!